A new photodetector can cleanly discriminate among four states, not just the standard two states of binary logic. "That's not what I meant": human communication is fraught with misinterpretation. Written out in longhand, words and letters can be misread. A telegraph clerk can mistake a dot for a dash. Noise will always be with us, but at least a new JQI device has established a new standard for reading quantum information with a minimum of uncertainty. Success has come by viewing light pulses not with a single passive detector with but an adaptive network of detectors with feedback. The work on JQI's new, more assured photonic protocol was led by Francisco Becerra and carried out in Alan Migdall's JQI lab. They report their results in Nature Photonics. Here are some things you need to know to appreciate this development. Digital data, in its simplest form, can be read with a process called on-off keying: a detector senses the intensity of incoming bursts of electrons in wires or photons through fibers and assigns a value of 0 or 1. A more sophisticated approach to modulating a signal (not merely off/on) is to encode data in the phase of the pulse. In "phase-shift keying," information is encoded in the amount of phase shift imposed on a carrier wave; the phase of the wave is how far along the wave cycle you happen to be (say, at the top of a crest or the bottom of a trough in a sinusoidal, as in this figure). Larger words can be assembled from a small suite of symbols. The Roman alphabet has 26 letters, the Greek only 24. Binary logic, and most transistors, makes do with just a two-letter alphabet. Everything is a 0 or a 1, and larger numbers and letters and words are assembled from as many binary bits as are necessary. But what if we enlarged the alphabet from two to four? In quaternary logic more data can be conveyed in a single pulse. The cost of this increase is having to write and read 4 states of modulation (or 4 symbols). Even more efficient in terms of packing data, but correspondingly more difficult to implement, is logic based on 6 states, or 8, or any higher number. Digital data at its most basic—-at the level of transistor—-remains in binary form, but for communicating this data, higher number alphabets can be used. In fact, high-definition television delivery already involves high-level logic. No matter what kind of logic is used, errors creep in. A detector doesn't just unequivocally measure a 0 or a 1. The reading process is imperfect. And even worse, the state of the light pulse is inherently uncertain, and that is a real problem when the light pulses belong to a set of overlapping states. This is illustrated in the figure below for binary and quaternary phase states. On the left side of the figure, the measurement of the phase of a light pulse is depicted, where there are only two choices. Is the pulse in the alpha state or the –alpha state? Because the tails of one overlap the other there is a slight ambiguity that leads to uncertainty in which state a measurement indicates. On the right, four possible states are depicted on a complex-number graph (with real (Re) and imaginary (Im) axes). Here the overlap of the states is more complicated, but results in similar ambiguities of the measured states, seen mostly near the borders (decision threshold lines) between the states. Decades ago communications theory established a minimal uncertainty for the accurate transmission and detection of information encoded in overlapping states. The hypothetical minimal detection error using conventional schemes is called the standard quantum limit and it depends on things like how many photons of light comprise the signal, how many levels (binary, quaternary, etc.) need to be read out, and which physical property of light is used to encode the information, such as the phase. But starting in the 1970s with physicist Carl W. Helstrom, some scientists have felt that the standard quantum limit could be circumvented. The JQI researchers do exactly this by using not a single passive photo-detector, but an active detection process involving a series of stages. At each stage, the current light signal strikes a partially-silvered mirror, which peels off a fraction of the pulse for analysis and the rest goes on to subsequent stages. At each stage the signal is combined with a separate reference oscillator wave used as a phase reference against which the signal phase is determined. This is done by shifting the reference wave by a known amount and letting it interfere with the signal wave at the beamsplitter. By altering that known shift, the interference pattern can reveal something about the phase of the input pulse. By combining many such stages (see the figure below) and using information gained by previous stages to adjust the phase of the reference wave in successive stages, a better estimate of the signal phase can be obtained. Detecting phase in this adaptive way, and implemented in a feedback manner, the JQI system is able to beat the standard quantum limit for a set of 4 states (quaternary) encoding information as a phase. These states are represented as fuzzy distributions arranged at different angles around a circle as seen in the figure above where the angles represent the phase of the light pulses. The error probabilities measured for the system (black points with error bars) fall well below the quantum limit, by about 6 decibels in the center of the curve. This is equivalent to saying that the JQI receiver is performing better than the SQL by a factor of about 4 in determining the phase of an incoming signal. That is, the JQI receiver achieves an error probability that is 4 times lower than the so-called "Standard Quantum Limit." This graph shows results for a system that implements 10 adaptive measurements. The two other lines on the chart show what the expected uncertainty would be for a perfect system (100% efficient detectors) and without any of the imperfections that would be encountered in any realistic implementation, and a hypothetical ultimate-limit on uncertainty derived by Helstrom. To conclude, the JQI photon receiver features an error rate four times lower than perfect conventional receivers, over a wide range of photon number, and with discrimination for four states. 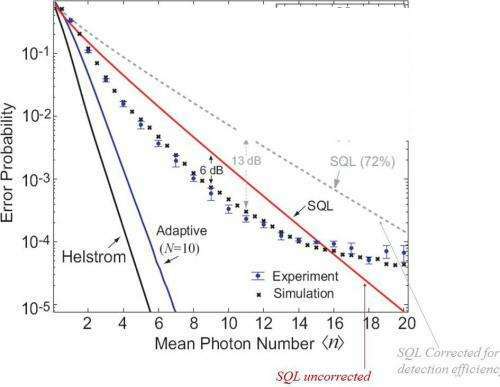 The only previous detection below the quantum limit was for a very narrow range of photons and with only a 2-state protocol and only slightly below the SQL. More information: "Experimental demonstration of a receiver beating the standard quantum limit for multiple nonorthogonal state discrimination," by F. E. Becerra, J. Fan, G. Baumgartner, J. Goldhar, J. T. Kosloski, and A. Migdall, Nature Photonics, published online 6 January 2013. "Digital data at its most basic—-at the level of transistor—-remains in binary form..."
Well, yes, but it doesn't *have* to be binary transistors. We're just really good at making super cheap, ever-shrinking flat-plane binary transistors. Other base architectures are possible. When flat-plane binary transistors etched into silicon can no longer produce the speed and information density improvements which are desired by a huge and lucrative market, the appeal of alternative base architectures will rise. I look for an end to flat plane architectures and the arrival of multi-mode 'transistors' (though they'll undoubtedly receive different names) capable of assuming and representing more than two states. I guess I'm sort of predicting the return of analog computing, but at the nanometers scale. By manipulating phase, polarity, voltage, magnetic field orientation, etc. we ought to be able to go far, far beyond binary transistors. Moore's Law has a good long while to run, I think.